Located on the desirable Ocean Drive avenue of the Royal Westmoreland Golf Resort, Howzat! is an executive 5 bedroom 6 bathroom private residence which offers unobstructed views of the 13th fairway and out to the western coastline. The main floor of this residence offers one en suite twin bedroom, an air conditioned TV Room outfitted with a surround sound plasma TV and DVD player, plus a pull out sofa bed. Also on this level is a study and two sitting areas, both of which open out onto the expansive covered patio where you can relax with a good book, enjoy an afternoon cup of tea and dine al fresco. The pool deck is furnished with comfortable sun loungers around the pool. Just off the main sitting areas is a spacious fully equipped induction kitchen outfitted with espresso machine, Miele coffee maker, double ovens, wine cooler, wet bar, an 8 seater dining area and a built in wok, ideal for the cooking enthusiast, and those who love to entertain. The Master Suite and first guest bedroom is on the upper level. Both bedrooms are ensuite, are air-conditioned with ceiling fans and share a large patio that offers beautiful fairway and sea views. These bedrooms also share an interconnecting walk-in closet and can be locked off if necessary. Both bedrooms are furnished with a king size bed and plasma TV. To the left of the pool deck is a self contained detached guest cottage with two more en suite bedrooms, each with twin beds that can be made up as a king size bed if preferred. The fully equipped kitchenette comes complete with dish washer, and the lounge is outfitted with a plasma TV and DVD player. Guests of Howzat! can enjoy the use of the property’s golf cart as well as all of the amenities of the Royal Westmoreland Resort. These include golf, tennis, gym, The Sanctuary, club house, and beach facilities located on Mullins Beach, with free shuttle service. Howzat! comes with a cook and housekeeper who work Monday to Saturday, 8:30am to 4pm. The cook is not included with the 3 bedroom Low Season rate. Howzat! is just a few minutes drive down the hill and into Holetown, where you will find a vast array of fabulous restaurants, shops and nightlife. Read past Guest Reviews of Howzat! here. 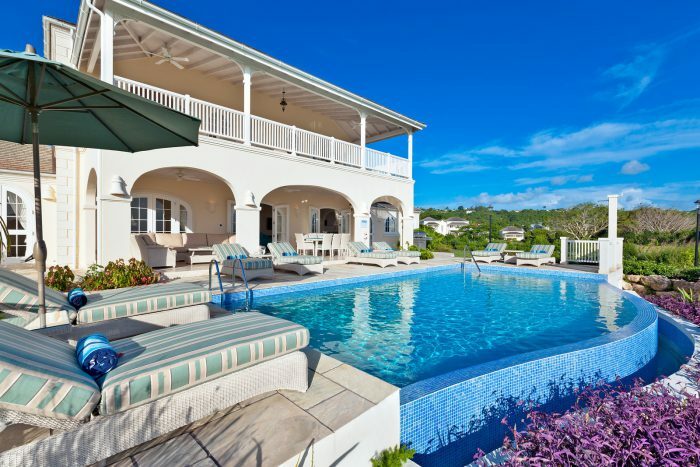 An impressive villa strategically positioned on a ridge commanding breathtaking views across the immaculately groomed golf course with private swimming pool, ideal for the golf, fitness and tennis enthusiasts since guests have access to all the resort's amenities including the clubhouse and Rum Shack.